Briggs & Stratton Professional Series Engine: Clear areas up to 17500 sq. ft. per hour with the 190cc Briggs & Stratton engine. Materials: Eat up leaves, seeds, mulch, blooms, branches, litter, and debris. 12 Inch Wheels: The 12 inch wheels move easily over rough, hard, or soft terrain while continuing to pick up debris. Warranty: This machine comes with a reassuring 1 year machine warranty; 3 year engine warranty (consumer). 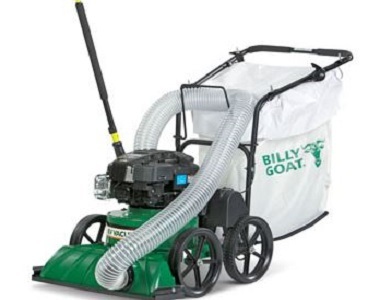 Ask us about the Billy Goat KV601 190cc (Briggs) Multi-Purpose Leaf & Lawn Vacuum. Please no repair questions. Your Q&A may be posted to MowersAtJacks.com to help other shoppers, like you, with their purchasing decisions. Thank you. Will this machine pick up all my pine needles in my yard?? Bob, this walk behind lawn/litter vacuum picks up pine cones, leaves, grass clippings, bottles, cans & glass. Add options now for your Billy Goat KV601 - Lawn Vacuum at a 1 time discounted price. When you are ready to check out, just click the ADD TO CART button.